Green pease recipe collection. Green peas, or matar, is a tiny green colored, round vegetable which is found in pods. Having a slightly sweet taste, they cut through the savory nature of certain vegetables and gives it a pleasant taste. Matar is also used widely in Indian cuisine in subzis, rotis and even soups. Best enjoyed in the winter months, matar can also be enjoyed during the summer to cool off. Matar and methi go extremely well together and when mixed with garam masala and fresh cream, gives a beautiful subzi of Methi Matar Malai. Matar also makes a wonderful combination with potatoes and gives the easiest subzi in anyone's arsenal, Aloo mutter. A super healthy and delicious subzi, that is not only easy to make but also cooked with just a little bit of oil, is Masala Cauliflower with green peas, a dry subzi with all the basic Indian Spices. With soothing peas and a cream cashew paste, tangy tomatoes and fragrant masalas, Matar Tamatar is definitely our new favorite, especially when served with piping hot parathas and raitas. To add a little a little protein and iron, Palak Matar paneer is the best thing you will eat. Green peas are used in every facet of Indian cooking, especially in snacks. The most famous way to use matar is to use it as a filling in the Gujarati snack called Ghughra, or Vatana ni Kachori. Here, a filling of green peas, coconut and various spices is cooked, filled inside whole wheat dough and fried to perfection. In the same way we can also prepare Matar Kachori and Vatana samosa, both being similar to ghughra but with little difference in filling. Chaat is a street side specialty in India but who knew we could make healthy variations using green peas? A simple Mutter chaat with baked sev only has 100 calories per serving! Another one is with potatoes and paneer which is jazzed up with chaat masala called Aloo Paneer Mutter Chaat. A simple Rava green peas tikki is also delectable and tasty! Making a soup out of green peas will give you an extra creamy texture as they are super soft and mushy when cooked. Green pea and mint soup is a versatile soup that can be had cold in summer and warm in winter! it is creamy and has an undertone of freshness to it which is lovely. With corn, peas taste brilliant. They combine to form a luscious soup called Green pea and Corn soup. Not only do the peas give taste, but they also give a vibrant green color. With the increase in consumption of fresh fruits and vegetables, people are adding their own twists to incorporate more vegetables. Green peas waffles is one such recipe where you make savory waffles with a health angle. Gujaratis have also incorporated crushed peas in their panki batter to make Green peas Panki. Another very innovative recipe is Green pea Uttapa. Uttapa Is generally never made with green peas, but with this matar recipe, you are in for a great treat with the excellent flavor. Adding matar to a paratha jazzes it up and diverts from the usual aloo paratha! Mixed with paneer, Paneer and Green Peas Stuffed Parathas is a sumptuous treat to enjoy! We already know that peas and mint make a hit combination. So, adding them to a pulao where they really complement each other's taste, is what makes Green peas and mint pulao delicious. Green peas Masala curry is a side dish that can be prepared quickly and with very few ingredients that are readily available in an Indian household. Don’t shy away from making sweets with it. Matar ki Kheer not only gives a great mouth feel but also earns you points for innovation. 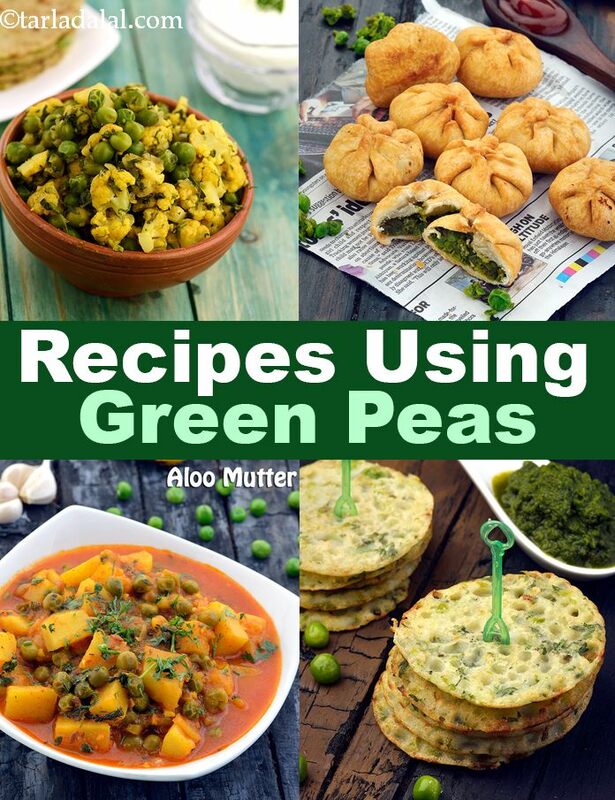 Enjoy our collection of 1,000 Green Peas Recipe or Matar Recipes below. Suggested serving size for 100 calories: 2 tikkis low in effort, low in calories– replace starchy potatoes with semolina in this tasty tikki and stuff it with a spicy green peas filling that’s high in vitamins and fibre. Use the microwave to cook the frozen or fresh green peas with these simple instructions, quickly and then use them to make pea puree which can be used in various recipes.